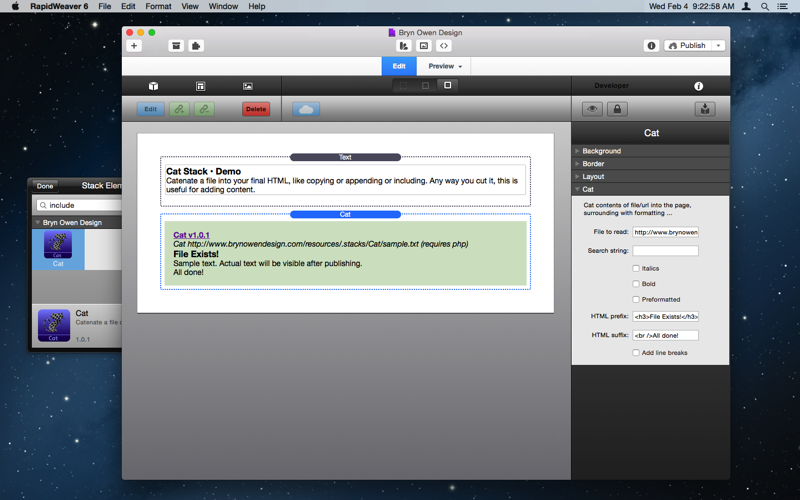 Catenate a file into your final HTML, like copying or appending or including. Any way you cut it, this is useful for adding content. Add the contents of a resource text, spreadsheet, Markdown, or HTML snippet file into your page. 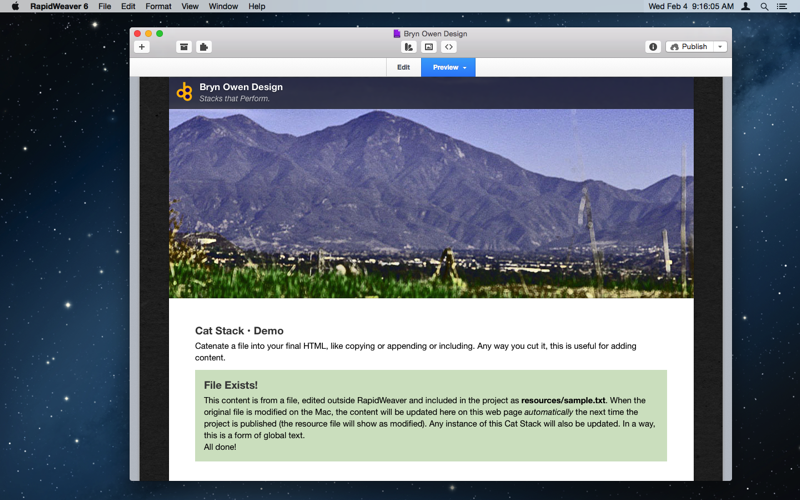 Similar to global content but controlled from a resource file. There is no error and no output if the resource file does not exist. Nice and clean. You can also specify a file URL to pull content from a published resource on another site. Now supports sorting and Markdown. PHP is used to read the remote file and dump its contents. 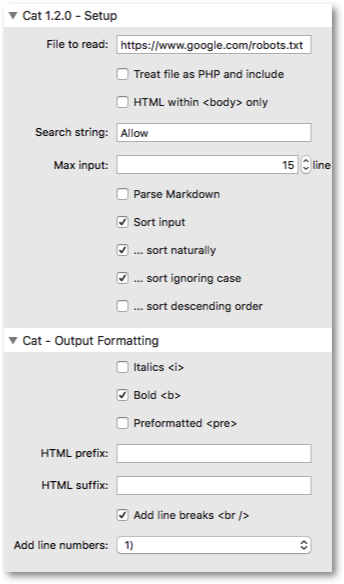 The Cat Stack has options for choosing the file or URL to read and display, and whether to format the resulting content using surround HTML tags for pre-formatting, bold, italics, or any other tags or content you like. You can also filter the output by searching for specific lines. File to read Specify the file name or URL to catenate. This file may be plain text, HTML, Markdown, or any other format such as CSV. Treat file as PHP and include Enable this to include other PHP files instead of their content. If you wish to show the contents of a PHP file, do not enable this. HTML within <body> only Scan within <body> and </body> tags to ignore other content of HTML files that can cause problems. Search string Optional filtering: only show lines that contain this search string, case sensitive. If this is left blank then all lines from the file/url are shown. Max input Set this value to non-zero to set a limit to the number of lines read. This may be useful if you want to use this Stack to show a snippet of file content but not the whole file. A value of zero here means no limit. Parse Markdown Treat file contents as Markdown and convert to HTML. Sort input Enable sorting of input lines, and use the options below to control sorting method, case, and order. ... sort naturally The default is regular sorting (a1,a10,a2,b1,b10,b2). Enable this option to sort naturally, as humans (a1,a2,a10,b1,b2,b10). ... sort ignoring case The default is to sort considering A/a case, but enabling this will ignore case. ... sort descending order The default is to sort from A to Z, but enabling this will reverse the sort order. Italics <i> Use <i> </i> tags around the content. Bold <b> Use <b> </b> tags around the content. Preformatted <pre> Use <pre> </pre> tags around the content, as you might surrounding code etc. HTML prefix Begin with any HTML code or opening tags like <b><i><em> etc., before the content. If the file does not exist then this prefix is not shown, so this may be used for headings or introduction text. Note: any opening prefix codes here should be closed in the suffix field below in reverse order. HTML suffix Follow with any HTML code or closing tags like </em></i></b> etc. after the content, if it exists. If the file does not exist this suffix is not shown, so it may also be used for captions below the content. Note: any opening prefix codes in the field above should be closed in reverse order here. Add line breaks <br /> Add <br /> tag to the end of each line read from the file. Add line numbers Choose the style of line numbering to use or None to disable this feature (the default). Example 1: the content below is a file in the RW resources area, and contains plain text with Markdown. 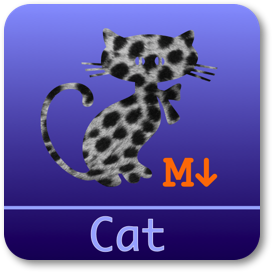 Whenever the resource file changes, any Cat Stack pointing to it will also change! This content is from a file containing Markdown.